This a collection of mainly 70s Brazilian funk, jazz and some bossa, with all tracks featuring a Fender Rhodes electric piano somewhere in the mix. Joao Donato is the star here, of course – apart from his three tracks, we’ve got also got Marcos Valle and Emilio Santiago covering his songs, and he’s all over the Orlandivo track with his funky keyboards and production. I’m a total sucker for the ‘beautiful melancholy’ of some brazilian orchestrators, so we’ve also got the dark beauty of works by Hermeto Pascoal. Luis Eca and Moacir Santos running through their own tracks and others. Listen to Airto's beautiful take on Hermeto's 'Mae Cambina' . Finally, “special contemporary guest” for this edition of the Rhodes series is Ed Motta with ‘Coisas Naturais’ from the fantastic “Dwitza” album. Give me a shout there if you’re in love with a particular track and curious about what album it comes from. Enjoy! Found six versions on my computer after I read your post too ....Cal Tjader one has a rhodes , so next issue promised! Excellent stuff; I nearly called one of my children 'Fender Rhodes' in homage. A bit of jazz-rock fusion a la Chick Corea's own electric piano skills as well please! Hey Simon, you'll have to stop on over to Ile Oxumare. Katonah just found that Yana Purim debut album I've been looking for and it's just up. That Taiguara album is so so good! I had seen it around in shops for years and avoided buying it. Pretty recently I read a description of it and then couldn't find it anywhere. I can't believe I've missed out on it all these years--and like you I'm pretty big into Brazilian music. Man, music blogs are effing awesome! I like a lot of tracks from that! Great idea - really enjoying your first comp so looking forward to this too. Many thanks. Nice, just the sort of thing I'm in the mood for - even if it is ****ing down with rain here in London as usual! Cheers. I very much enjoyed this compilation. Thanks a lot. If there is ever gonna be a second Brazil compilation, you might consider to include some Elis Regina songs with Cesar Camargo Mariano on Fender Rhodes. For example, the Cobra Criada song on the Live in Montreux CD starts off with an amazing rhodes intro. hey flageolette, glad you enjoyed it, try this one as well if you get a chance. SImon- this is really, honestly and truly a MAGNIFICENT comp. You would be hired by SOUL JAZZ, Soundways, Wax Poetic, etc. in a heartbeat (yeah, them too). This is simply breathtaking stuff. But now I feel compelled to give something back. The best thing I could think of is a link to an African vinyl junkie from western Europe. Enjoy! Can you upload that Emilio Santiago 'bananeira' album. Muito obrigado. Thanks homie! thanks for the kind words, did you try the other brazil compilation as well? I just discovered your blog last week. It's simply fantastic; well categorised and lots of nice background info. Thank you! BRAZIL RHODES 3 is up now, come and check it! Wonderful synergy here. Thanks very much. Loving this, my first neverenoughrhodes download. Am looking forward to listening to your other compilations. Interesting to see the Hermeto connections too...recently got into him through a review of the Django Bates album 'Spring is here, shall we dance'. Great effort putting this together my friend! 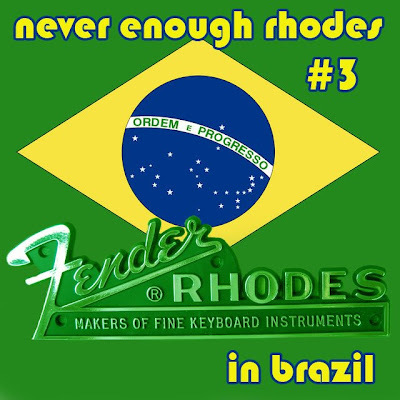 I am excited to hear some Rhodes In Brazil, looks real good, thank you!